At Beltane, the light is waxing stronger. Beltane is traditionally celebrated on the eve of May 1st. Some Neo-Pagans celebrate the spring cross-quarter at the mid-point between the spring equinox and summer solstice, which usually occurs around May 4th or 5th. Beltane corresponds with the English quarter-day, “May Day”. The most common folk element of May Day celebrations which continues today is the Maypole, which has been adopted by many Neo-Pagans. Beltane or May Day is universally considered a time for joyful celebration. 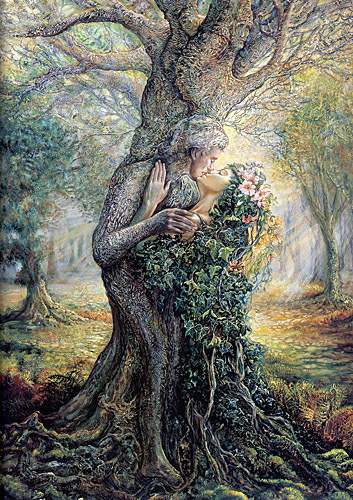 For many Neo-Pagans, Beltane is associated with the marriage of the Oak King to the Goddess. On the Wheel of the Year, Beltane is the mirror image of Samhain, on which the Wild Hunt is set loose to bring winter into the world. In northern Europe, Walpurgis Night is celebrated as the last night that the Wild Hunt of winter rides free. For many Neo-Pagans, Beltane and Samhain are treated as the most important dates on the Wheel of the Year. There is no universal outline for the Wheel of the Year. Every version differs in the details of the Mythos and which events are assigned to which point on the Wheel. According to one version, at Beltane, the Dark God is bound, but not slain. The Stag King takes his oath to the Goddess, now the May Queen, the representative of sovereignty. The Goddess and her Consort are married. By virtue of his marriage to the Queen, the God is crowned and becomes the Oak King.